The use of seal stamps originates from ancient Mesopotamia. The first cilindrical seals were created between the rivers Eufrate and Tigris, made of stone, semi-precious stone or shell material. The oldest examples date back to 4000-3000 BC. The design on the seal is made in reverse (mirror image) so that the actual design is correctly when it is pressed into clay or wax. A big advantage is that the same impression can be repeated indefinitely. Flat seals or cartouches were used in ancient Egypt, as well as signet-rings. The Greek civilisation is well known for their highly skilled artists and carving techniques, also visible in their sculpture and on coins. Starting with soft stone and ivory in the early Minoan age, the production of seals became a true art form with highly desirable engraved gems during the Classical and Hellenistic period. Not surprisingly Pliny the Elder reports that Mithridates of Pontus was a major collector. During the Roman Empire the use of seals was widely spread. Many exquisite examples of engraved gems, with depictions of the Roman gods or portraits have survived. Often these gems were incorporated in jewellery like pendants or rings (seal rings) . In lower classes stamps were made with cheaper materials and had various purposes: assaying marks (quality control), makers' marks or to seal personal letters or documents. Many examples of Roman oil lamps bear the name of the maker or workshop on the bottom. 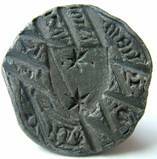 Personal seals for documents were made of small pieces of clay, molded around a string and stamped with a seal. There are known examples of these 'bulla's' as a result of a fire. The original document was lost but the clay bulla was hardened in the heat and survived. 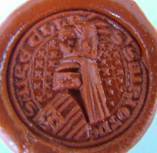 In some cases the wax seal was protected by putting a seal box around the seal. There are four main shape categories: circular, piriform or leaf shape, square and lozenge shape boxes. There are a few seals that have survived from the Dark Ages. A very famous detectorfind from Norfolk is a two-sided gold seal matrix which has been attributed to Queen Bathild, wife of Clovis II. One side shows a woman's face and in Frankish lettering " BALDAHILDIS ". The other side show a naked couple, embracing beneath a cross. In Tournai the grave of Childeric also contained a gold signet ring with the inscription "CHILDERICI REGIS". Initally the designs started with a Byzantine-style portrait and later evolved into full portraits, often bearing a sword, sceptre and orb. In the 10th century princes, bishops and higher ecclesiasstical officials adopted the use of seals to ensure that important information was kept secure and to prevent forgeries or alterations on official documents. 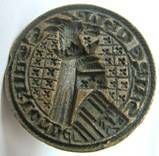 To possess a personal seal was usually reserved for the higher class nobility and clerics. In the High and Late Middle Ages armorial or heraldic seals were used by the secular nobility, showing a coat of arms, sometimes with a personal motto. 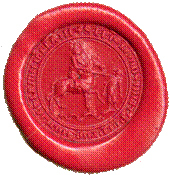 Equestrian type seals could both be civilian or military. Contrary to popular belief, seals were not always attached directly to the document they served. Most were attached with cords or small strips of parchment to the bottom edge of the document where they hung freely. 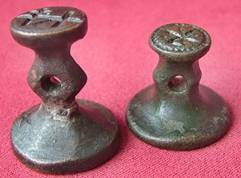 As this also made the seal vulnerable they frequently put metal or wood skippets or protective pouches, made of leather or fabric around the seals to protect them. 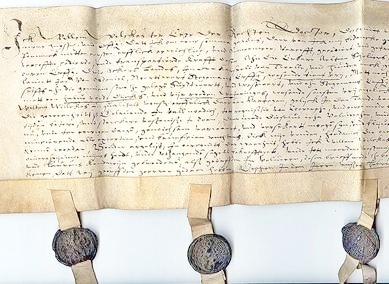 Here below is an example of an official document concerning the transfer of land in Twello, dated 1625. At the bottom there are three official seals attached with parchment strips. 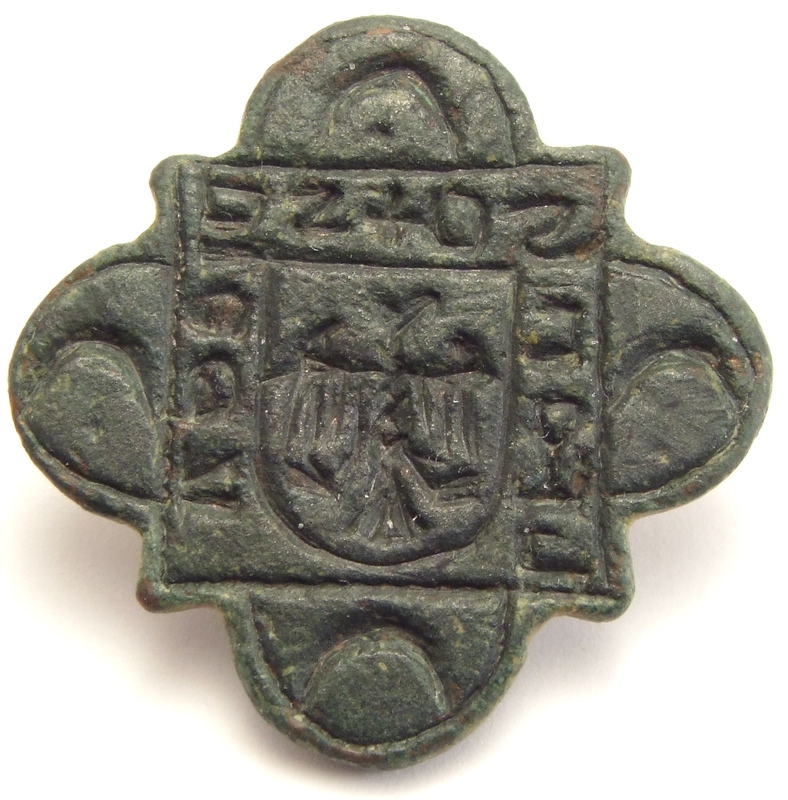 In the Middle Ages Vessica shaped seals (pointed ovals) are often used for ecclesiastic seals or for seals for women. A central figure of the owner or a saint is often surrounded with a legend indicating the name of the owner. The legend often starts with the letter S' which is an abbreviation of 'Sigillum', meaning 'Seal of'. French bronze seal with tournament helmet and coat of arms. When influential burghers and rich merchants adopted the custom of sealing documents a great variety in shapes and designs occurred. As these offer a great variety in shapes and designs they are still keenly collected today. The profession of the owner could be used on the design: a jug for a jugmaker or scissors for a tailor. Some are very personal with a name or title, others are more general with an object or animal and a general motto. These were very popular as they were much easier to replace when a seal was lost. A few designs seem to have been very popular: four-leaf clover, crossed hands (friendship) or a squirrel, sometimes cracking a nut and a legend "I CRAKE NOTIS". 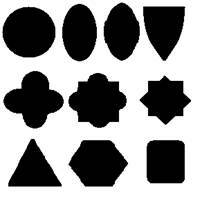 A few basic shapes, many variations are possible. Housemarks: In the Middle Ages traders and merchants were not allowed to bear arms. To identify themselves or mark their products they adopted their personal mark (house mark). These marks must be easy to cut or engrave. Since many people were illiterate the design must be distinctive and easy to remember (functional). The merchant's marks or house marks were often passed on to the next generation with a small addition or difference in detail to distinguish between father and son. As the merchant class increased in wealth and status, the marks began to appear in shield-shaped frames. They are frequently used as a desgin on seals, stained glass, brass, stone and on tombstones.